Climate Interactive has released a huge new update to C-ROADS World Climate, our climate change policy simulator. Version 1.1 now includes 3 times as many graphs and 3 times as many languages as the previous version. Updated with new data and the ability to connect with audiences in their language of choice, we’re proud to release this free tool to the global climate community. Use C-ROADS World Climate in Japanese! 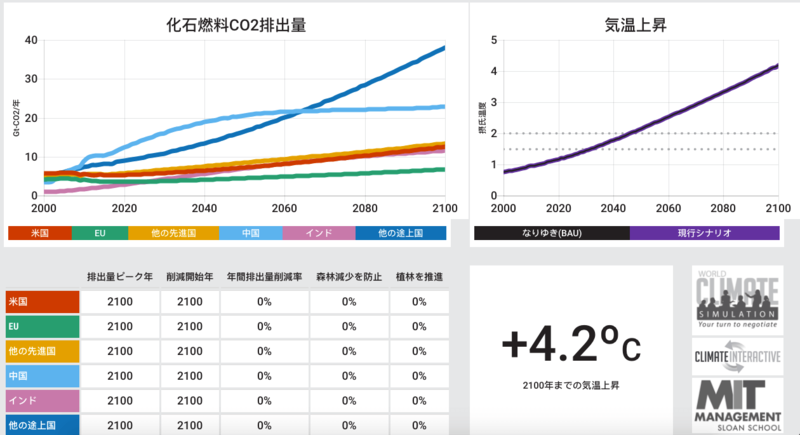 People frequently use C-ROADS World Climate to support the World Climate role-play exercise. This new version will be even more useful during the role-play because you can now show new graphs that might speak to your audience better. Need to show Population? Check. How about Net Forestry Removals by Country? We’ve got you covered. Explore the new menu to see the 30+ new graphs. C-ROADS World Climate now supports English, French, Spanish, Turkish, Japanese, and German. We’re very grateful for all the hard work our volunteer translators put into the effort — thank you! Everyone on the team is excited that the simulator can speak to new audiences. Another big feature that we’ve added is the ability to interactively explore the “Assumption and Sensitivities” settings. We allowed users to change the values before, but now they are sliders that can be shown while the graphs are fully visible. This change, along with a lot of additional tweaks and changes under the hood, should make the app more useful. 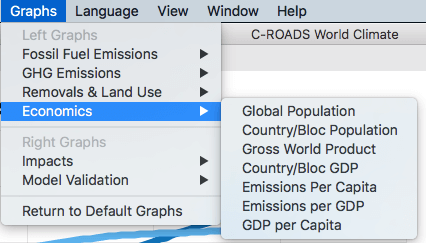 Version 1.1 of C-ROADS World Climate can be downloaded and run on Mac OS and Windows. There is also a version hosted on the web. If you’ve previously downloaded the Mac and Windows version, the new version will automatically download and update in the background. Please launch the application, leave it running for about five minutes (depending on your Internet connection), and then restart the application. The new version will automatically load after it has downloaded in the background. A big thanks to Todd, Phil, and all our international translators for their hard work on this release. As usual, the app is free — so go use it!